I thoroughly enjoy Town Lake. It must be the natural setting of the trail as opposed to city streets. In any case I started out slow. I was thinking that this was my fate and I must accept it. I stayed with a few of the slower people at the back of the pack. However at about 2 miles into the 10 miles I passed them and ran to catch up with the next cluster of runners about 400 yards ahead. I caught them at the 3 mile water stop. So I began again to reel in the next group ahead of me, and caught them at the 5 mile water stop. At about 6 miles I saw Sadie, Belle, and Clarence ahead and slowly caught up to them. I was no longer running easy, but I also wasn’t over-my-head. So I stayed with Sadie and Clarence until the Mopac bridge and then to the end. It felt good to run like that – to let it out. I thanked them for letting me chase them. I complete the 10 miles in 1:35 or about 9:30/M. It felt good. On Thursday morning Matthew and I completed the 5 mile Turkey Trot. We arrived early to pick up our packets and pin on our race numbers. Up until this one we never had timing chips so I don’t remember how we did previously. This time we took it real easy. Matthew was concerned about his legs and ankles. He said that last year he sped up near the end too soon. So we ran at about 12 minute/mile pace. From previous years I didn’t remember the number of rolling hills that this course includes. However, we both remember the final hill right near the finish. We stuck together and crossed in 58:35. Later we went to the Kathy and Ken F’s for a very nice Thanksgiving dinner. I give thanks to my son Matthew who shared this with me. No one else in my family has ever run with me and that is very special to me. Thanks Matthew! Update: I dug up my old race numbers and on the back were our times. Nothing to say other than I did it. It’s been two weeks and the 16 miles are far behind me especially in my memory. I ran by myself. All I remember is that around 8 instead of making a left turn I went straight ahead and was following this guy who I later realized was running the 18 mile route. About 1/2 mile into it he was far ahead and no one had passed me which I hadn’t expected. It was then I stopped, took out my map and figured out my mistake. After two rights and about another 1/2 mile I was back on the route. This means that I actually ran about 17 miles, however, someone said once we completed that the 16 miles was really 15.2 so I really did 16 miles. In any case, this run again emphasized that I have appreciably slowed-down. I will be running Motive Bison Stampede in honor of my friend Jack W. who is living with Chronic Lymphocytic Leukemia (CLL). 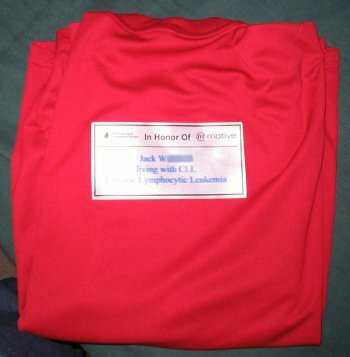 All race proceeds are donated to The Leukemia & Lymphoma Society (LLS) to support research and patient services. You are in my thoughts Jack. Update:Finished in 2:09:41 or 9:54/M. Completed goals #1 (started), #2 (finished), #3 (ran entire race). Near the end my mantra “This is for Jack” kept me from walking, and helped me finish. Now I’m a bit sore, especially my left hamstring, but it was worth it. At class this week coach Karen asked if I was running Motive this weekend. Motive is a half-marathon this Sunday at 7:30 AM that’s part of the Austin Distance Challenge. I responded by saying no, that I had planned to do my long run on Saturday. She said good, because she was recommending that. Well on Thursday I receive an e-mail at work from Motive stating that my race number was #810 and packet pick up was Friday and Saturday. Puzzled, it finally dawned on me that a while back Matthew had considered running this race with me and at that time he declined but I indeed signed up for it. Sheesh, if that isn’t symptomatic of my CRS* I don’t know what is. Naturally I sent a note to coach Karen saying I goofed. If Motive hadn’t send me that e-mail I would have totally skipped it. 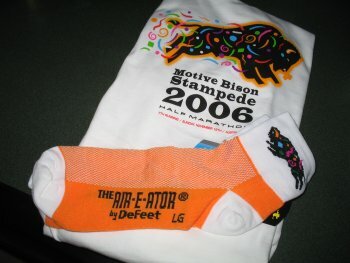 And I had been thinking that I wouldn’t get another T-shirt and a neat pair of sox. So tommorrow I will be running my first race after the Chicago marathon, but my plan is to take it real easy – kinda like what I did for the marathon. * Can’t Remember Sh*t.
We had it easy tonight which included a 1 mile warm up, then 4 miles at half-marathon-pace (whatever that is for me now, I don’t really know), and then 1 mile cool down. I am very appreciative that Karen S., the coach, let me join this group. I’m the only one she let in from the short course. There were many people in class whose faces I recognize but whose names I’m at a loss. It’ll take me some time to get them figured out. For the 4 miles I really didn’t push it, but when I got near the 2 mile mark I thought I’d give a try. So although I was worried about my left hamstring I did the best I could. When I got done in 34:40 (8:40/M) I was happy and getting back to my car I felt so good that I could run and enjoy myself that I got chills. It was a good thing, a very good thing. OK, so I ran with the class group even though the class doesn’t officially start until this week. As I said earlier I’m joining an existing class so I got up at 5:30 AM, left the house at 6 AM, and started at 6:30 AM with a few people from the class who I already know. That was real nice to have people I know to run with. I ran with Melody and Susan mostly and part of the time with Terry and Rasheev(?). We took it real easy, and we talked and chatted the whole way. It was fun and I’m glad to be back in class. I never started my watch nor looked at it during or when I finished so I don’t know how I did. I think that’s a good thing. I just need to relax and enjoy running for the pure pleasure of the experience. That’s something I’ve been missing. Right now I’m a bit sore, but that’s to be expected both at my age and since I’ve been taking it easy these past two weeks. Note: I have signed up to watch the NYC Marathon live tomorrow morning on the internet through MediaZone.com. I’m interested in watching Lance Armstrong and to see how he does. My fingers are crossed for him. I wishing him well on his first marathon. I just signed up for my next marathon course with Rogue Training Systems. The first class for me is next week on Tuesday November 7, 2007, and the AT&T Austin Marathon is Sunday, February 18. 2007. I will be joining the existing marathon course that began in September, but since I’ve just completed the Chicago marathon they think I can jump right into the middle of this training. I’ll keep you posted as to what takes place. I’ve got to be stupid to keep doing this, but somehow I find it fun in a cruel sort of way. Wish me luck.